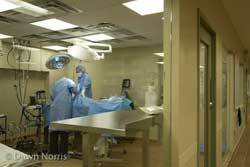 Surgery suite at NYC Veterinary Specialists & Cancer Treatment Center. Three specialty veterinary hospitals have merged to form BluePearl Veterinary Partners, bringing together more than 100 veterinarians. The hospitals are Florida Veterinary Specialists and Cancer Treatment Center in Tampa, Fla., NYC Veterinary Specialists and Cancer Treatment Center in New York City and Veterinary Specialty and Emergency Center in Overland Park, Kan.
“Our goal is to set a new standard for referral practices,” said Neil Shaw, DVM, Dipl. ACVIM, chief medical officer of BluePearl Veterinary Partners and founder of Florida Veterinary Specialists and NYC Veterinary Specialists. BluePearl Veterinary Partners’ primary relationship is with the pet family practitioner, Dr. Shaw said. The group has come up with a “ five point commitment” that includes committing itself to exceptional patient care and client service; not providing routine, general or prophylactic care; operating strictly by referral; calling and mailing a written report for every referral; and always having a clinician available to consult with a colleague when they call. BluePearl Veterinary Partners maintains that it is unique in that it is completely owned from within the industry. Each managing partner is either a veterinarian or manager actively working at one of the hospitals on a day-to-day basis.